Computers make decisions 1,000 times faster than humans’ most automatic, instinctual reactions. So as algorithms exert more and more control over our daily lives, how can humans maintain oversight of machines that deliberate at a pace we can barely comprehend? 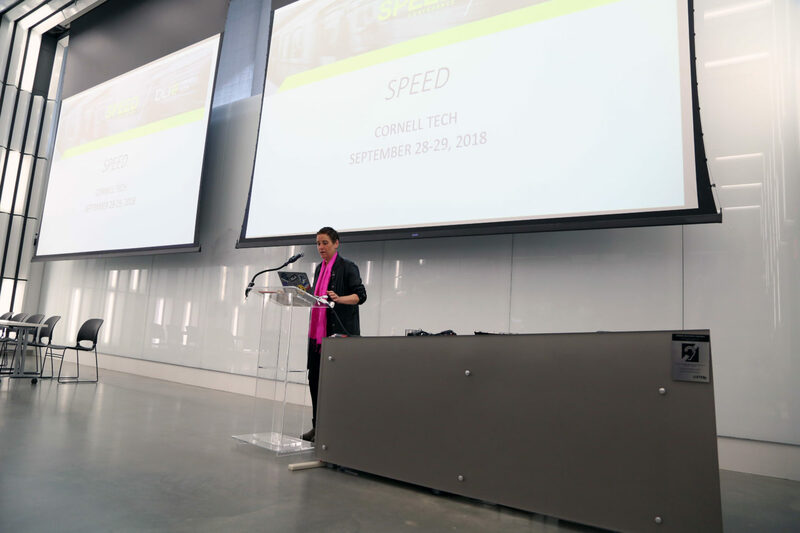 This is among the core issues being explored at the Sept. 28-29 Speed Conference, hosted by Cornell Tech’s Digital Life Initiative (DLI), a cross-disciplinary and cross-campus program aimed at uniting students and scholars to analyze technology’s impact on society. Faculty from Cornell’s Ithaca and New York City campuses, as well as Stanford University, Columbia University, Northeastern University and other schools, will speak on panels examining the role of technology and speed in areas like content moderation, finance, warfare and policing, and labor and manufacturing. Panelists at the Speed Conference will include Nissenbaum; conference co-chair James Grimmelman, professor of law at Cornell Tech and Cornell Law School; Steven Jackson, associate professor of information science; and Wendy Ju, assistant professor of information science in the Jacobs Technion-Cornell Institute at Cornell Tech. The Speed Conference is one of the first major events from DLI, which launched in 2017. The initiative also holds a weekly seminar series at Cornell Tech, open to the public, focusing on the development and application of digital technology. A DLI doctoral fellowship began this semester, drawing students from across Cornell’s campuses. As the effort continues ramping up, Nissenbaum said she hopes DLI can support cross-disciplinary research projects on related topics, as well as additional classes. The Speed Conference is supported by Microsoft.